Ready to talk about your own project? YA is a digital marketing promotions services company focused on helping clients improve customer acquisition, retention, engagement, and win-back. YA’s solutions encourage consumer engagement through promotional marketing programs including: rebates, referrals, enter-to-win (sweepstakes, games and contests), sampling, loyalty and channel incentives. For nearly 50 years, YA has been delivering inventive solutions with breakthrough results to well-known consumer brands around the world. In 2015, Young America rebranded under the name YA Engage. The rebrand effort at that time was to take some of the focus off of the fulfillment history so the company could become more credible in the promotional marketing space. This caused YA to struggle with telling a consistent company story, while also dealing with a website that was confusing to navigate and didn’t fully showcase the wide range of capabilities YA can offer to B2C companies. Since YA competes on a global scale with other promotional marketing companies to deliver large-scale complex programs that deliver high quality execution for its clients, it needed a better way to demonstrate its expertise in delivering a seamless consumer experience. YA came to FZ for help in building a new website and redefining its brand to show its effectiveness in building customer loyalty through creative, successful programs. 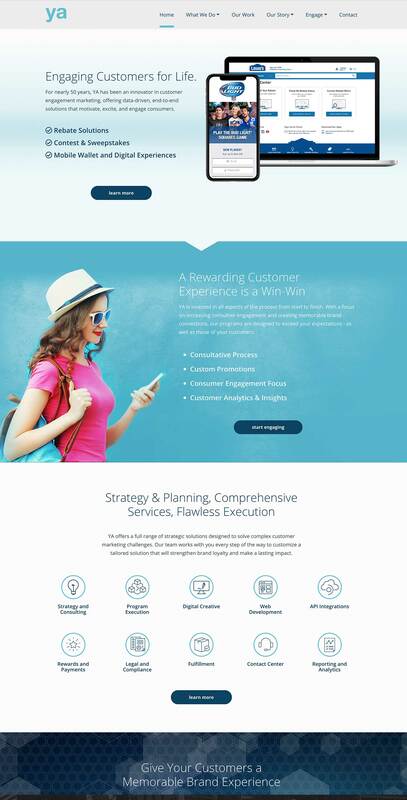 The team at FZ understood that differentiating the company from the competition was key, so they set out to retell the company story via a brand new website that more accurately captures the YA Engage of today. Through tagline and extensive key message development, FZ strengthened YA’s corporate image and clarified its brand promise. To highlight YA’s depth and breadth of promotional marketing programs, FZ built a website that was designed to showcase multiple client success stories. The result is a modernized online experience, strong brand messaging, and renewed interest in YA among Fortune 500 B2C companies. FZ designed and developed a fully-customized WordPress website with a full Content Management System (CMS) for the YA team to seamlessly make edits to the website without coding knowledge. The site is also fully integrated with HubSpot technology, allowing for seamless a/b testing of every form, CTA, Landing Page. Three blog feeds were created to highlight research, news and editorial content separately. The new web presence has firmly cemented YA as an industry leader! Ready to tell us about your project?